If you've never been there, the I can has cheezburger site is a place where people post pictures of their pets and put funny captions on them. The captions are written in a babytalk/imaginary pet language with its own orthography. In any case, they have branched out into other realms. 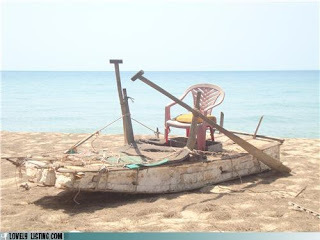 I am posting a photo from that website here because it is obviously a prime example of post-apocalyptic boat building. If you want to see it in its original environment, go here. Then you can also look a funny cat pictures. Some points worth mentioning: The upright rowing posts and the oarlocks, a piece of rope or rag tied around both oar and post and the fact that the boat is rowed by the rower facing forward place it somewhere in east Asia. Normally, the person rowing is standing, but who knows, maybe they need a break sometime, hence the lawn chair.